When I worked for Amazon I regularly worked on Amazon escalations that had been sent to Jeff. So I know what Amazon is looking for. Now, I work on them from the outside for my clients. I received a message the other day from a seller who sells across many marketplaces globally. I have helped him deal with common problems every seller faces when they get stuck dealing with Amazon teams. “Btw, this will be the last time I ask you. I promise. But what does “escalate” a case mean? How does one ‘escalate’”? Most sellers who read articles and listen to podcasts on this topic still come away scratching their heads. What is an escalation, anyway? What goes into one, and how do I write it? There are a lot of conflicting opinions and plenty of confusion over this process. You need someone who used to work on Bezos escalations to understand those. Most sellers don’t even understand how to do an Amazon escalation WITHIN the team that suspended their account or ASIN. Escalating to Jeff (or Anyone At Amazon, Really): What Do I Say Anyway? Consider the amount of revenue at stake, and the fact that an escalation likely represents your last go-round of attempts to sell on Amazon again. Don’t you want to maximise your odds of a successful appeal? You’ll want to maximise your odds of getting it done right, and fast. Most people realize the need to complain the right way in an escalation. They state that they’ve submitted Plans of Action several times without any meaningful response from the other side. Whether they are asked for “more information” over and over or sent general denials, “We’ve reviewed your Amazon account, and have decided that you may no longer sell.” Seller Performance teams will never tell you what’s missing or what needs to be improved unless they have Account Health services call you up and explain it. Even then, in many cases, sellers do exactly what they are told to do, only to have Seller Performance refuse it or fail to reply. Not sure when to escalate? Read our guide. So How Do I Write an Amazon Escalation? Some say keep it short and sweet. They want you to send only a few lines indicating it’s been a poor selling experience to receive the same messages over and over without resolution. Then talk about how long you’ve sold, how good your metrics are, and how much you’re losing waiting to sell again. Some even say pull on the heartstrings and beg them to come back to save your business and family finances. I say that you should only do that if you have little to say overall and if you are escalating simply to throw something at the wall, and hope it might stick. But I also say that has a low percentage of working. Don’t tell yourself you’re escalating your own case just to get it over with, and out of your mind. It won’t leave your mind at all if it fails to work. Don’t focus on sob stories in a loaded emotional plea or the thin line between loving and hating Amazon. Do tell them how you’ve addressed and solved in your POA all past problems, and encourage them to read it again. Show some bulleted highlights! Briefly describe why your solutions will work. Be convincing. Don’t waste space talking about past glory days from before your suspension, with details on all the great metrics and years of sales. Write up a single sentence that covers both, and leave it at that. Do not devote a full paragraph to describing what a wonderful seller you are. Every time their eyes glaze over and they move on to the next case. 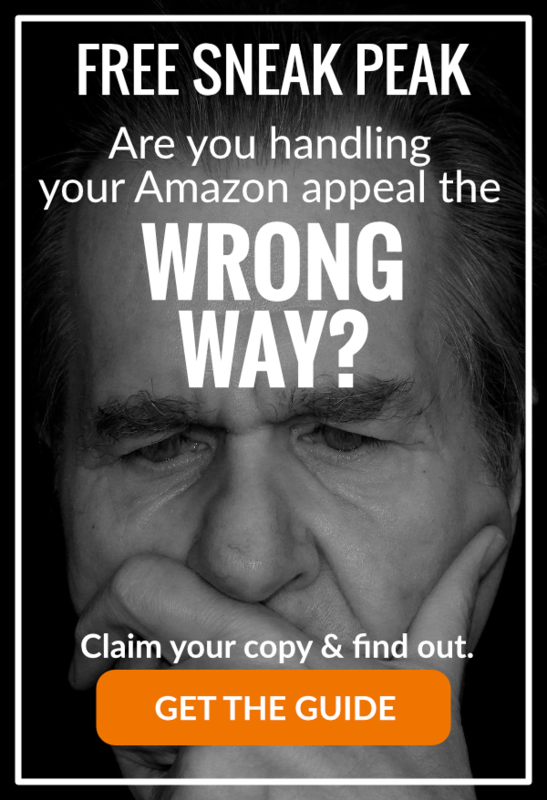 Don‘t send the same old POA to different queues and think that you have “escalated” it, telling Amazon you’re still suspended after giving them what they asked for. I hear about this approach failing sellers more than anything else, yet sellers continue to believe it works. Don’t just think about where to send it. Think about WHAT to send, and how good it is. And don’t send it in pieces, assuming they can collate it all. Put the appeal and escalation all together, in one submission, each time. Don’t take everything straight to Jeff. I know the forums and various Facebook groups are full of this advice. Everyone thinks they’re an expert, yet this is the most foolish advice I see on there. As discouraging and repetitively unhelpful many emails to Seller Performance can feel, you should try at least once to request action by a manager or senior investigator. I can’t tell you how many times we’ve done this and avoided any emails to Jeff/ Executive Seller Relations at all. It is worth one properly written, well-composed attempt. 1. Have a Good POA to go with your Amazon Escalation. Don’t write an escalation letter that would make Shakespeare cry, then attach a weak POA. Not sure when or if you have a good one? I can help with that. It’s worth a second or third opinion, especially if it represents your last chance at reinstatement of a top selling ASIN or your entire account. You can emphasize the best parts of the POA in your escalation letter, including your top three completed proactive solutions that fully resolved past problems while preventing fresh ones in the future. They want to believe they can reinstate you and that you won’t make the same mistakes all over again. If you fail to do that, it could result in an investigation audit and a bad mark on their own record. Convince them that will never happen. Show them the documentation to prove it. 2. Understand that writing to Jeff isn’t what it used to be. You may land a hurried, distracted investigator who took too long on their previous three Jeff emails that hour. If they are going to motor through your appeal, make sure it’s readable and easy to understand! Get your best writer on it, and edit it for clarity. Unclear POAs or Amazon escalation letters get tossed to the side. Simply looking for a reply when you’ve sent a few emails including all relevant info they ignored? Here’s a quick example to get the ball rolling. There’s nothing wrong with nudging them to review you the right way, especially when you’ve heard nothing back from them for days. We ask that you confirm the receipt of our plan of action as requested by your team, as we have received no update on the progress of our account review. We have sent your team the performance plan and documentation required to reinstate our account and have not received a reply after multiple days. Then include the highlight reel of all the wonderful measures you’ve put into place. Not only are the measures implemented, by the way, they’re working! Tell Amazon how. 3. Make it clear what you’re asking them for and state plainly that you’ve pursued accepted channels already to handle the matter, without resolution. Whether you seek account or ASIN reinstatement based on your appeals or you’ve reported hijacked listing behavior, counterfeit sales, or fake product reviews that Abuse teams refused to take action, you need to make your request easy to understand. 5. Use your best writer and communicator. Don’t send them something with poor English, or jumbled up, convoluted ideas that lead nowhere. No investigator has time to waste on something poorly written. Too much is it stake for you even to think about risking a denial over bad writing. If you don’t have a good writer who understands some of the language needed in an Amazon escalation letter, find one and make sure they know what they are doing. 6. Highlight the merits of your POA and the number of times, and dates, that you sent it in. If you received the “We need more information” email multiple times without any clarification of what might be wrong with past POAs, indicate that in your Amazon escalation. If you received nothing, or a generic denial, tell them. You have no real idea what they’ve done with your POA. They may have barely annotated your account. Anyone who reads your escalation can look inside your account though, and decide for himself or herself if you were given proper consideration. 7. Keep it to a couple of paragraphs of tight, direct sentences that each nudge your argument forward. Show them you understand exactly what happened that led to your suspension, without retroactively fighting with them about the validity of the causes or debating with them how harshly they treated you. Hopefully, you’ve already sent an appeal written like this to Seller Performance and asked for a manager to review it. If not, perhaps you can try that before going to Jeff. It’s worth a shot, if your appeal and POA are rock-solid and unimpeachable. Don’t blame Amazon angrily if you didn’t approach the escalation work the right way to begin with, knowing it could be your last chance. Please don’t gamble that you understand this material enough on your own before emailing these email queues. In most cases I handle, the life of the business or even the financial health of my client is at stake when we help them compose escalations. Winging it or trusting a bad source of info on these may not be something you can correct later, if you’re wrong. Do things the right way, the first time.